Over the past twenty-five years, The Employers Edge, our organizational development and talent management company, has been tracking the character and skill competencies that are most frequently causing leaders to fail or fall short of expectations in their leadership role. We didn’t measure this but it’s safe to say the inverse is true as to what propels a leader to achieve great leadership success. For example, if lack of communication is the number one competency that contributing to a leaders detriment, then great communication is the number one competency contributing to a leaders success. 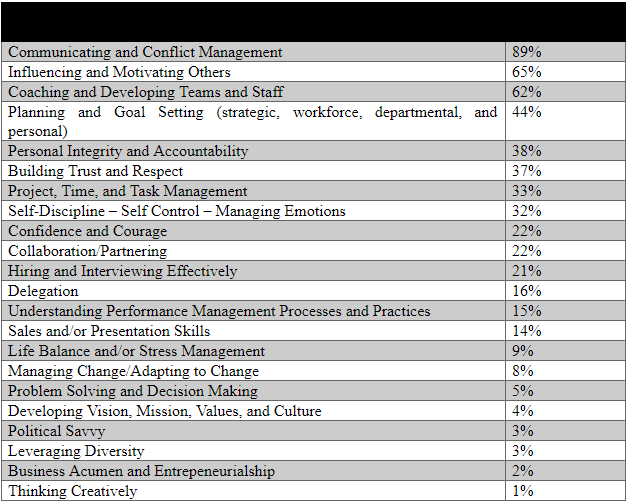 Below is a table of the competency weaknesses we have seen, based upon coaching over 8,000 leaders in 400 client companies. The % reveals the competencies that have been in the most need of improvement. We have coached numerous leaders on how to exercise and grow in these areas in order to get better results for the organization. In most cases, a leader needs improvement in an average of three to four areas at any specific time during their career. Communication is the biggest little concept on the planet. Sounds so simple on the surface. As a boss I give instructions and you follow those instructions. I ask for solutions you give solutions. It’s not that hard; or is it. One of the reasons communication is the overwhelming competency we get asked to coach leaders on is due to a leadership mindset, and that mindset affects how, what, when, and why people communicate. That mindset is that our communication style is super obvious to us and therefore, it is super obvious to the other party also. And that is so far from reality. For example, if I don’t need to give you every detail, that means you don’t need to get every detail. If I just need to share the highlights, that means you only need the highlights. If I don’t need to communicate the expected result because it is so obvious, then that means you don’t need to hear it. After all, it’s so obvious. The other mindset shift that can lead to miscommunication is when one persons mind is in the right here and now, and the other persons mind is focused on where this going conversation going or what does it mean. For example, the boss says “get me the inventory report”, and the Ops Manager thinks “what do you need that for?” There mindsets are in two different places thus making for huge potential to miscommunicate. The point, improving communication is better achieved when the leader gets their people in the right frame of mind first, and then doesn’t assume that their own brand of communication is as obvious to others as it is to them.